Salomon Speedtrak Reviewed - To Buy or Not in Apr 2019? 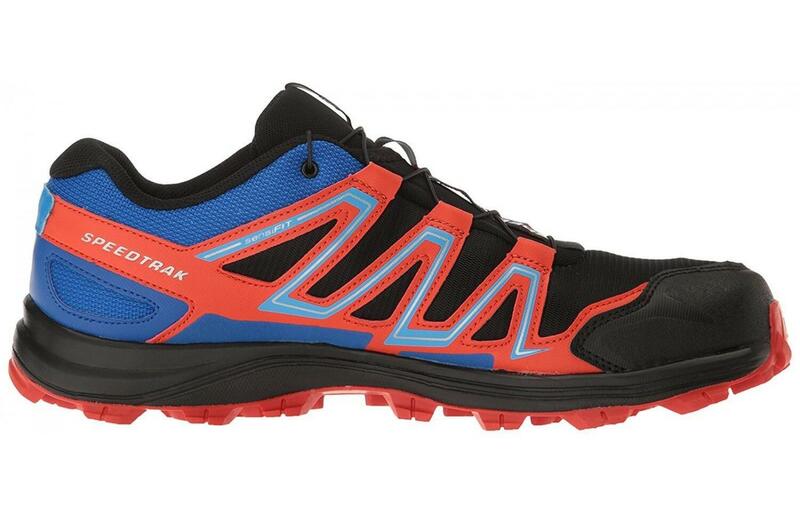 The Salomon Speedtrak is a revamped version of the Fellraiser. Outdoor enthusiasts love this shoe for obstacle races and long distance ultramarathons. Regardless of the weather conditions or terrain, this shoe can handle it. The upper has been redesigned to include a more durable, more breathable upper. The upper now comes with TPU overlays to lock the foot in place. The midsole features a simple, but effective EVA midsole foam that absorbs shock and keeps the runner close to the ground. Runners love the responsive, durable outsole of this shoe too. It uses Salomon’s tough Wet Traction Contagrip to grip the terrain below regardless of the conditions. The lug system is specifically designed to ensure that mud and debris shakes off quickly. The Speedtrak is lightweight enough to promote speed and agility for the runner but it is durable and protective enough to take the runner through some of the toughest terrains. The price is reasonable considering how long this shoe lasts for and how protective and secure it is to the runner. The style is rugged and bright and runners loved that it got them noticed on the trail and set them apart from other racers. We have spent 5 hours analyzing a total of 420 reviews. I purchase Salomon always for my hikes. These have held up nice and are for a more medium to light hikes. I am never disappointed with them. They have stiffer shoes for more long distance. This is my daily hiking shoe. It is perfect. just like all the others but a more mild build for strolling. Not so much for the big guns. It has a much stiffer sol than my other Salomons. I bought two of these right off the bat. I knew they would be great. Thee are durable and have wonderful sull support for the hiking I do. The grip is a life saver ad keeps me from slipping around. I have high arches and these support that and fit to size. I am comparing these to my other Salomon Speedcross. These are just as I expected: rigid, durable, wide toe space and protection, sturdy and comfortable. They aren't quite as comfy as my old speeds but they are ok. The cleats are definitely better though and grip great. I ordered a half size bigger for weather purposes and wearing large sox and hey are great. The shoe fits to size. I did some comparing with other trail shoes and these were comparable to the lightest with more pizazz and girth. They have a great ground control and grip to them and you’re able to feel the ground without absorbing the contact. The toe box was a bit too wide for y normal taste but I can handle it. Had a great all over padding that not so greatly holds water in. They do drain though. These are my new mudder shoes. I have no issues when in action and the comfort I want is there. I highly recommend these shoes. I tested these babies right out the box on some gnarly terrain in the mountains. I wanted to get a pure sesh in before I left for my trail going trip. The traction was great in the slopes of ice and snow, no issues. I like more arch support than these offer. However, they are pretty cushy. I ordered a D and they fit my super wide feet great, no narrowness or pressure and I did buy a half size up. These are great off road tires for your feet. The knobs are a sweet double action grip, front and reverse. The toes are a bit small but I am feeling they will break in nice. The heel is snug and doesn't swim around. Really great trailer. Traction on these is great: wet rocks, ice, snow and grips great in dry and mud. They fit super true to size. I had to get used to the laces but the system is great once that was over with. They are great quality that of Salomon I am used too. These are as close to the Fellraisers as you can come. They are light and great on the PA terrain. They are really aggressive in the stability department and have great soles and lugs. These also look really rad and the lacing is dope, super quick. This has a great profile, which is low and sturdy. You can hit hard and jagged rocks with the feel of your feet without the feel of the rock entering it. The deep grips get into the terrain and keep yo fro slipping; I have never went down with these. They drain well and dry fast. These are the same exact thing as the infamous Fellraisers. I cannot find a difference. I found Salomo a few years back and I cannot get enough. I saw these and had to have them for my trails. They are super supportive. They fit nice to size, they have great arches and they don’t crush my toes t death. I love these for all sorts of activities: walking, running, hiking, etc. They fit to size just like all of m Salomons and they breath well. I feel safe with these everytime I hit a steep incline and loose gravel. They are perfect for this type of terrain. I have bought 3 pairs and am over the moon with them. They fit perfect in all areas, nothing bad to say. I used these in the rain and mud for a Spartan OC and I was secure and planted. I had no issues with grip or water logging. They are bit tighter than I am usd to for these type of shoes but they are so worth it. Plus, when getting stuck in the mud and pulling out, they do not slide off because they are secure. Thee have great terrain response and grip better than any trail shoe I have bought. They are a bit snug but I like that. They fit perfect and have no friction to them. These are so good and i highly recommend them. The lugs on these dig into the snow and loose terrain like a champ. They are comfortable and stable. Not the best on the real slick glare I sized up since I bought these for winter so I could use thick socks and they are perfect. The shoe laces are great as they stay in place and stay tied. I was able to wash these in a machine with no deformities and they sprayed off easy. YAY! I took these through deep slush and ice and mud, they were great! They fit so snug and perfect, like they are an extension of your body. I love them. No aches and pains! Thee fit me true to my normal shoe size. They have phenomenal grip, allowing me to make quick moves and change direction with ease. These are perfect shoes to me for what they are made for. These are really nice on the more rugged steep trails. They are a bit wide in the toes, more than I was used too. I still like them though. A bit snug but no pain. These have been perfect for my slow pitch ball games. They are just the right comfort and ruggedness. These are my fourth pair of Saloman trails. I have to say they are the best shoes out there They last a really long time and they are so very comfortable. I am a happy customer for sure. These are strict to the trails shoe. None of that pavement business. They are mean in the mud and grip great. They also work awesome on the dry stuff. These are a good ice gripper too! These have great stability and the laces were great once i figured them out. Great, great, shoe. I felt great after my run, no pain and no hot spots. They took all the trail in and kept me stable. They are stiffer and less cushioned than most of my shoes but do not bother me a bit They are durable and have a gripy soul. I am a fan of the laces not coming loose. These are not an everyday shoe. The sole alone is so rugged it is hard to walk on pavement. But, that is why I got them, for the trails. They are deep lugged and ready to hit all sorts of terrain without breaking your ankles. Super sturdy and super cushy. I loved my Speedcross. These were a let down. These were lacking in the stability and durability. The laces do not function anymore after one race. Everything was there except the width. They were so snug and made wearing them horrible. I also have a fray on the toe area which I am not happy about. They are just poorly fit to my feet, not comfy at all. I had to order a size and half p, making the shoe not fit right at all. I am upset because I heard good things. These were so damn narrow and after upping the size became too long. The back of my heels have craters in them from these shoes. I am not not able to wear anything comfortably and had to take a day off work my feet were so banged up. Really horrible heel area. I tried to get these to break in because I wanted them to work and they hurt my feet so bad. They never got any better obviously. They are way to small and stiff. The midsole is to bad and so hard and the insole is not for sufferers of Plantars, my feet were barkin’ so loud! I had to return these! To narrow and way too low of a profile for my taste. I cannot believe how narrow they made the toes on these. The Fellraiser was just like these but had a great toe area. I am not sure what happened but poor choice Salomon. I’ll be moving on now. Of the 420 reviews we found in total, 12% were negative, and 88% were positive. The outsole of this shoe provides amazing traction and durability and enables the runner to tackle some of the toughest terrains in the toughest conditions. 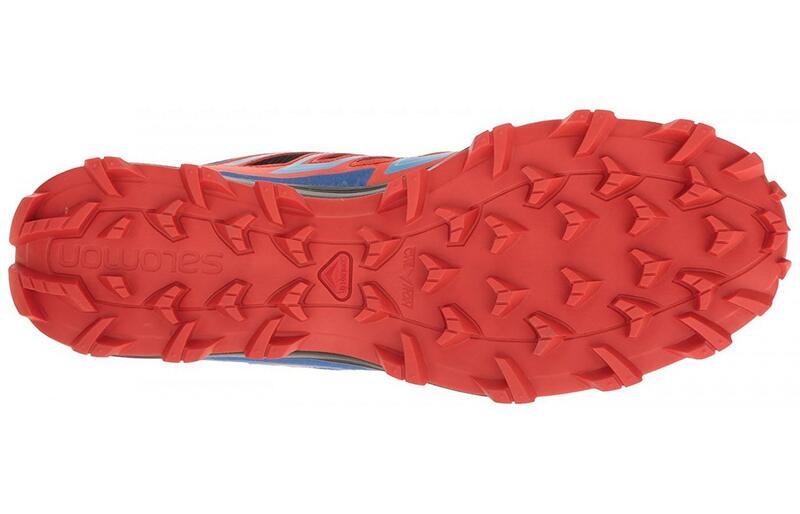 Salomon uses their Wet Traction ContaGrip outsole for the Speedtrack. Not only does this design feature an aggressive lug system that protects the runner, it also shakes off excessive mud and debris to keep the shoe free from dangerous elements that can reduce the traction. This outsole makes this shoe a great choice for obstacle races and even ultra marathons. Salomon made key improvements to the rubber material of the Wet Traction ContaGrip from the Fellraiser. Not only does it protect the runner from the harmful elements of the trail, it also lasts a long time. Salomon decided to go with a tradition EVA midsole foam. This foam tends to be bouncier and more responsive than some other options on the market today. The EVA foam is also a lighter in weight to help the shoe keep its overall lightweight fit and feel. The shoe also features an EVA shaped sock liner that provides superior support and more effective transitions from the toe off to the heel strike. The upper of the shoe is where Salomon made some key changes to the Fellraiser. The upper material is a closed mesh that is designed to simultaneously keep debris out of the shoe while allowing maximum airflow to reach the foot, keeping it cool and dry. 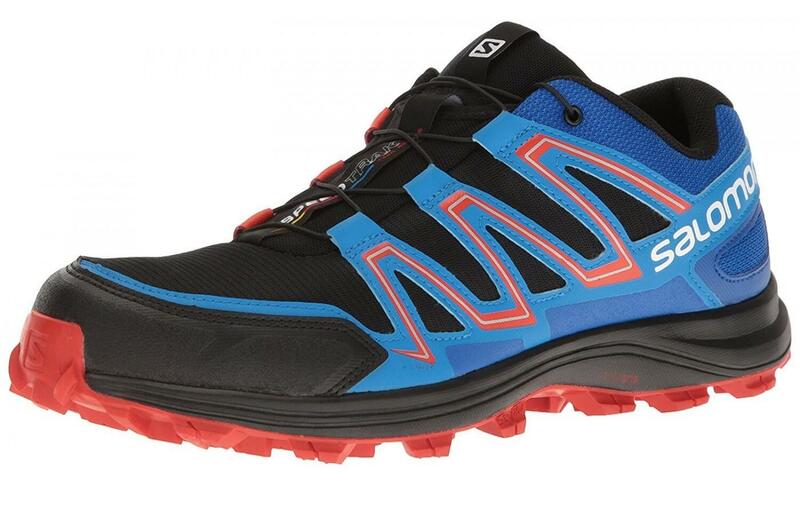 The entire upper is designed using Salomon’s patented SensiFit material. This material is secure and snug and cradles the foot and creates a unique fit for each runner because it adapts to the unique shape of each foot. The QuickLace system utilizes a single pull-tight design to make for an easy on and off fit that stays secure regardless of the conditions of the trail. The upper of the Speedtrack also features TPU overlays that are constructed from a durable, synthetic material. These overlays not only protect the runner from the elements of the trail, they also provide added durability to the shoe. Finally, Salomon finished off the upper with a protective toe cap that is made to keep the foot safe from roots and other unexpected trail elements. Runners found this element to be particularly useful for obstacle racing. The upper of the shoe is able to provide superior air flow while also providing protection from debris and trail elements. The upper features an anti-debris closed mesh. This allows air and moisture to exit the shoe to keep the foot cool and dry, but it also protects against harmful trail elements from entering the shoe. Runners reported that even in extreme conditions, their feet stayed cool and dry and free of irritation and blisters. This is a lightweight trail shoe that finds the right balance between protection and durability and a lightweight design that allows the runner to go fast. The shoe weighs in at 8.4 ounces which makes this one of the lightest trail racing shoes on the market today. Salomon was very smart in their engineering and was sure to only include technology that would protect the runner, add durability, but not add too much extra weight. The lightness of this shoe enables the runner to go fast and go far. The Salomon Speedtrak would not have been so highly suggested for ultra marathons and extreme trail runs if it wasn’t comfortable. Those races, in particular, require a high level of comfort, so even the smallest irritation can stop a runner in their tracks. The midsole foam features a traditional EVA foam which is lightweight but provides superior cushioning. The upper is breathable and the SensiFit technology molds to the shape of the foot, creating a unique fit for each runner. This shoe is bright and is designed to get the runner noticed. The colors options are bright and plentiful and the overall style is very different from anything on the market today. The synthetic overlays serve an important purpose to the shoe but they also provide a unique look to the shoe that runners enjoyed. This shoe provides superior durability through the use of the Wet Traction Contagrip and the synthetic overlays of the upper. The Wet Traction Contagrip is made using a highly durable rubber. This material does an amazing job of holding up against some of the toughest miles. Additionally, the upper features durable synthetic overlays. Runners were pleased to report that they experience zero rips or tears or fraying in the upper due to the overlays. 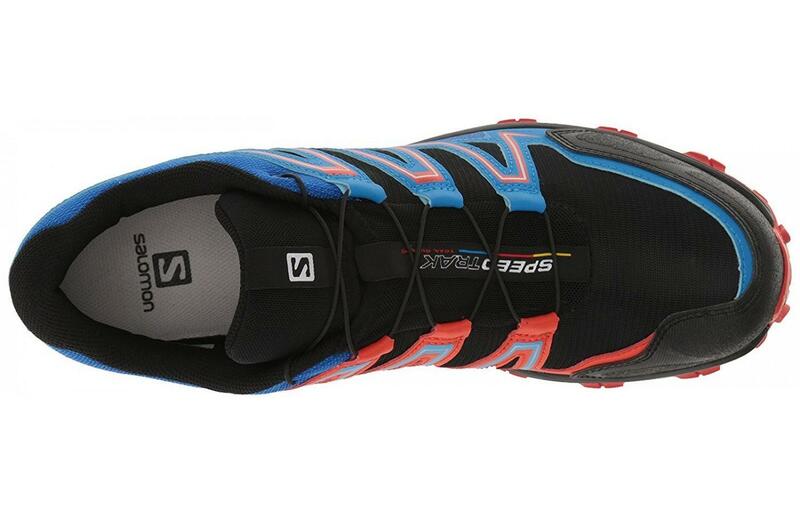 The Salomon Speedtrak protects better and last longer than other similar trail running shoes in the same class. This shoe provides ample protective elements which is a key reason why the Salomon Speektrak is such a great obstacle course racing shoe. For starters, the upper is made from an anti-debris mesh that protects the runners from debris entering the shoe and causing irritation or pain. The upper of the shoe is also designed with a protective toe cap that protects the foot from unforeseen elements on the trail like rocks and roots. Finally, the outsole of the shoe is designed using Salomon’s patented Wet Traction Contagrip. This provides superior traction to keep the runner safe on uneven, muddy, and slippery conditions. The EVA midsole used in this shoe provides responsive cushioning. Runners also liked that this shoe was low to the ground, giving them a better connection with the trail. This enabled the runner to make quick and efficient changes to pace and direction, which kept runners safe from slipping and falling on the trail. This shoe provides ample support through the EVA sock liner and the synthetic overlays found on the upper of the shoe. The EVA liner supports the runners by molding to the foot and working to keep the foot in place. The new addition of the TPU synthetic overlays hold the foot in place and eliminate the risk of unnecessary movement. This is especially important during obstacle races or ultra marathons and ensures that your form stays consistent. This shoe is designed for the most adventurous runners. Runners commented that whether they were running on mud or through water or on uneven, loose terrain, the Salomon Speedtrak handled it with no problems. Because of the superior traction and durability, runners loved this shoe for obstacle course racing, ultramarathons, or even hikes. This shoe can easily handle a groomed trail, but it is designed for the toughest conditions out there. Considering how many technological features this shoe has, runners were surprised at how affordable it is. This shoe comes in right at the average price point of quality trail running shoes on the market today. Additionally, the shoe has proven to stand up against the elements so well that it doesn't need to be replaced as frequently as other trail shoes. The Speedtrak was praised for its traction. The outsole is designed using Salomon’s patented Wet Traction Contagrip. This not only provides superior traction, but it also is designed specifically to shake off excess mud or debris in order to ensure that the runner stays safe and secure on the trail. The outsole features a multi-directional lug pattern to keep the runner safe whether they are running up steep hills or traversing down rocky down hills. This is also one of the key reasons this shoe is suggested by other runners for obstacle races like Spartan Races or Tough Mudders. The Sensifit upper material provides a flexible, adaptive fit for the runner that conforms to the unique shape of each foot. This is a lightweight, breathable material that moves with the natural movement of the foot. Additionally, the midsole of the shoe provides ample flexibility. The EVA midsole foam is designed to provide responsive cushioning that moves with the runners natural gait cycle. Although there are many great shoes on the market today that specifically address issues with pronation, the Salomon Speedtrak is not one of them. This shoe is designed to move with the foot as opposed to working to change the gait style or cycle. The EVA midsole foam does conform to the shape of the foot and provides some arch support, but there aren’t any specific pronation support features in this shoe. This shoe features a 6-millimeter heel drop. Runners loved how close and connected to the ground they were. The nearly flat feeling of the shoe enables the runner to respond quickly and efficiently to changes in the direction and surface of the trail below them. Runners reported that because of the lower drop, they felt more stable during their runs. The Salomon Speedtrak is a tough trail running shoe designed to take athletes across some of the toughest terrains. This shoe has a lightweight design that is also highly durable and provides superior traction. The upper keeps debris from entering the shoe and the midsole provides a responsive cushioning that runners love. The price is average for a shoe in this class, and runners love the bright, unique style and look.